Responsibly managing water resources is fundamental to modern natural gas and oil development. The U.S. energy renaissance is being driven by high-tech hydraulic fracturing and horizontal drilling, and those processes use water to produce the natural gas and oil that run our economy and the daily lives of individual Americans. Though the amount of water used for energy is a fraction of overall water use by society – a Texas report pegged it at less than 1 percent of the state's total water, industry knows that water is critically important to the welfare of the communities that host natural gas and oil development. Which is why individual companies are focused on cutting-edge technologies, systems and facilities to reuse water in their operations. Water treatment decisions hinge on the availability of treatment infrastructure, the quality of water needed for operations, transportation systems and the proximity of enough wells to capitalize on access to reused water. Although there’s no single approach that applies to every site, a 2014 Artemis Project report found that competition for mobile water treatment options in Pennsylvania’s Marcellus shale created competition similar to the market dynamics that helped shrink the size of cellphones. Bottom line: Using less freshwater to develop energy is important to communities and the environment – and it’s smart business as well. Examples of these technologies abound. 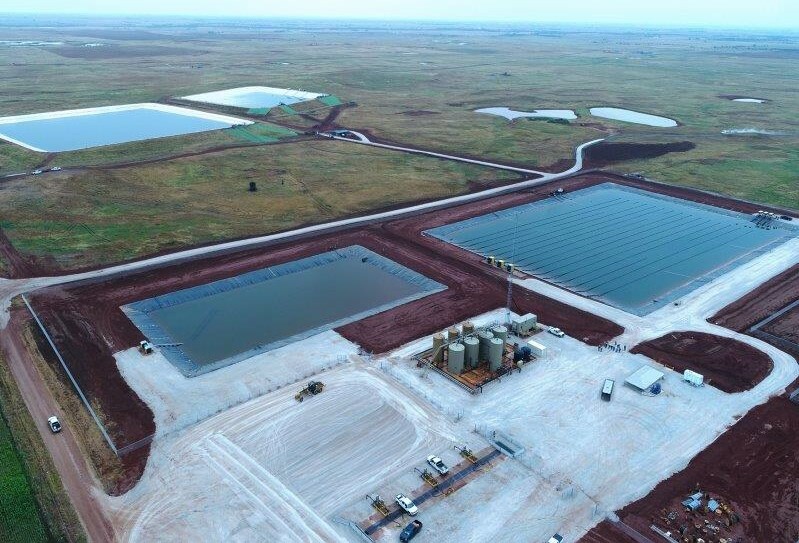 Newfield Exploration Company’s 30-acre Barton water recycling facility in Kingfisher County, Oklahoma, just completed a year of operations, allowing Newfield to save more than 7 million barrels of freshwater in that time. Durfey says the facility can process 30,000 barrels of water a day. This includes water from the hydraulic fracturing fluid used to develop wells and naturally occurring water from deep in the earth that’s produced when you build any natural gas or oil well. That saves 30,000 barrels of freshwater a day and eliminates 250 truckloads of water that otherwise would be transported over county roads. It also eliminates the need to dispose of produced water in injection wastewater wells. Meaningful advancements in purification technologies have allowed for significantly higher standards of industrial wastewater treatment while also expanding opportunities for reusing water in a growing variety of capacities. This is especially evident in the conventional sector of the oil and gas industry, where a combination of key drivers and the availability of increasingly robust and cost-effective treatment processes are spurring more initiatives that seek to maximize the amount of produced water and refinery wastewater that can be reused for beneficial purposes. Chevron works with Veolia North America to treat produced water from its San Ardo field in Southern California, treating 50,000 barrels a day. Veolia’s OPUS technology removes contaminants through a multiple-treatment process, resulting in freshwater that can be used to recharge aquifer basins and for steam generation used to recover more oil from reserves. Water Planet’s Intelliflux design, an automated and self-adapting system, optimizes the performance of ultrafiltration membranes in real time. A pilot in successfully processed 10 different kinds of produced water from a group of California oil producers. Fort Worth-based Bosque Systems is active in the Permian Basin, leasing land to set up 40,000-barrel tanks of recycled water and equipment for treatment so that the water may be used again by operators. Gradiant Energy Services’ membrane-free desalination process removes water vapor from produced water, leaving behind only contaminants, according to Rigzone.com. An onsite system recovers the purified water through a dehumidification process that’s powered by natural gas or an available heat source. With a water recovery rate between 90 and 98 percent, depending on the quality of the treated volume, the cost savings that come from using these advanced technologies is significant. Reusing produced and flowback water means lower freshwater usage, trucking and storage, and the cumulative cost savings associated with those activities only increase when treating water from multiple wells on a pad or multiple pads in a field area. Water recycling also means less water transport trucks on the road, which means less risk for a traffic incident, less road repairs and less truck noise for communities where hydraulic fracturing and conventional drilling are taking place, creating a win/win situation for all parties. Water management is fundamental to responsible energy development. Rapid growth in natural gas and oil development brings a number of challenges that are being met to safeguard employees, the environment and the communities that host energy operations. Constant development of new technologies and procedures to reduce freshwater use and to reuse water produced during well construction is basic to good resource stewardship.